Google Classroom – What? How? Why? 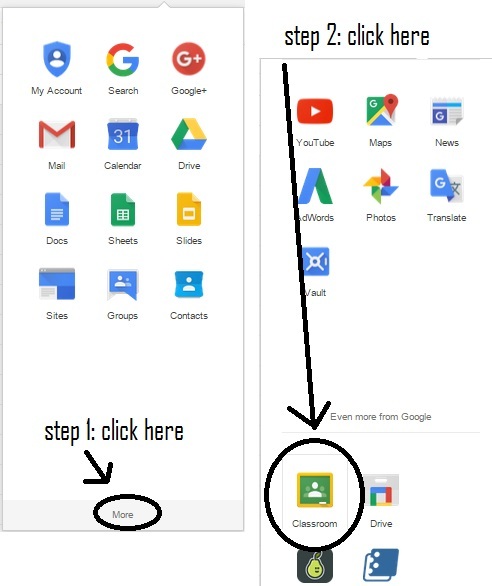 If you are looking for a super easy way to update your students, organize your classes, and keep students and parents in the know about homework, assignments, questions, and upcoming tests, Google Classroom is a must-have! What? Google Classroom is a service through Gmail (if your school has subscribed to it). How? You can find it by going to the top-right corner of your Gmail and clicking on the ‘Apps’ button. Top right corner, Google ‘Apps’. Next, Click on ‘More’ then ‘Classroom’. Once you get to the Classroom site, you can add classes (I like to specify the period, too, because then I can post individually to a class. This is nice because not all classes are in the same place every single day). To add students, copy the code on the left-hand side (students can add themselves!) and now you have a class! Students can simply go to ‘Classroom’ (the same way you did!) and add themselves with the code you give them. Or, you can invite them via email. Why? Super easy and convenient! A great way to update and share classroom information, and help kids that may have been absent! If you have questions, please comment!